Exclusive The ongoing x64 server chip war is going to heat up considerably in the third quarter, with both Intel and AMD firing off new processors for midrange server buyers. 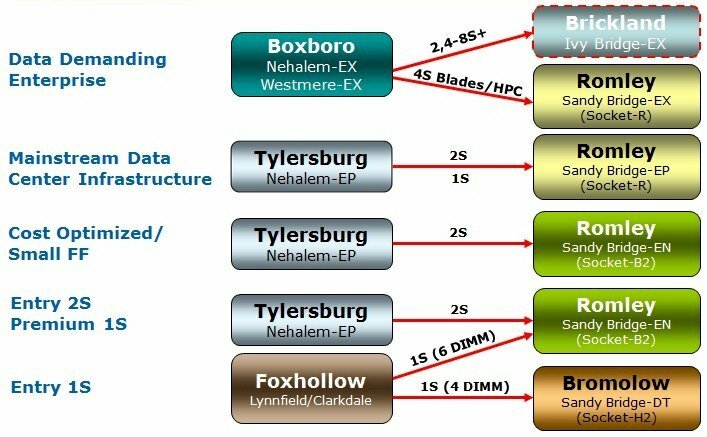 And we now have a few more details about Intel's future "Sandy Bridge" Xeon platforms and the chipsets that drive them. Processor socket and chipset transitions are a big deal, and if server makers don't get behind you – perhaps because there is a Great Recession on and they want to cut back on development costs and bet on the surest things to sell in the market – then you have a big problem. Like what AMD had in late 2009 with the delivery of its first home-grown server chipsets – the "Fiorano" SR56X0/SP5100 combo – and the Opteron 4100s in their C32 sockets and the Opteron 6100s in their G34 sockets, which make use of these chipsets, coming out the following spring. AMD had two different sockets and three different chipset variants to appeal from everything from low-powered single-socket servers all the way up to four-socket boxes with lots of memory and I/O expansion. The technology was good, and the price was right. It just so happened to coincide with a recession and a lot of companies betting on Intel's "Nehalem" generation and its new bus architecture. AMD does not have to go through painful processor socket and chipset transitions, as it had to last year to its financial chagrin. But it does have a new line of Opteron 4200 and 6200 chips coming out based on the "Bulldozer" cores and a ramp of GlobalFoundries' 32 nanometer wafer baking processes to contend with, so it is not easy skating for AMD, either. Still, AMD has been gloating a bit that the Bulldozer ramp will be easier and Intel has to juggle a bunch of things at the same time with the Sandy Bridge transition. That's true enough, of course. It is Intel's turn to have to change up sockets and chipsets with the Sandy Bridge Xeons, but Intel's 32 nanometer processes are fully ramped for its server chips, so that is not an issue. And because Intel has to change up server platforms anyway with the Sandy Bridge Xeons, the chip giant is taking the opportunity give server makers more options to accommodate the divergent needs of server makers. Intel already launched the Sandy Bridge-DT processors back in March, which we now know as the Xeon E3-1200 chips and which are mostly aimed at micro servers – machines with one socket and minimal memory and peripheral expansion. The Xeon E3 processors plug into Intel's Socket-H2 chip socket, also known as the LGA-1155 (which gives you the pin count and style of socket-to-chip interconnect, in this case a land grid array). The combination of the Xeon E3 processor, the H2 socket, and the "Cougar Point" C202/204/206 chipsets is known as the "Bromolow" platform.